The title of this post is not intended to depress you. The title of this post is to prepare you, so you can know how to navigate the inevitable. Time to put up a road block to "denial." If you recognize yourself as a leader (someone who has influence-great or small), then times of loneliness are familiar to you. You know what I mean. Remember when you spoke out in defense of a colleague, but no one joined you? How about when you embraced an idea that took longer to become a reality than many had patience for? If you're trying to get your arms around the idea, then I hope what I'm writing will inform and inspire. A place where you are taking a path less traveled. A place where you are facing fierce opposition. A place where you know you're right. A place like the Rubicon. A place of deep questioning. For those of you who lead in corporate America I feel a special connection. Please keep in-mind that leading is simply influencing. Leading is not exclusive to a title or job description. My loneliest times can be found during that period of my life spent inside of corporate America. Oh my, did I learn though! I learned what crucibles were all about. Ever been in a meeting where your authentic voice was ignored? I say authentic, because counter-genuine leadership is so prevalent today. Ever tried to tell your manager that customers are growing tired of the delays? But your manager turns it back on you and implies you're not a team player. Most mile markers on these roads are truly opportunities to grow. Even though you may feel strange because of your circumstances. Call it what you will, but you must go through in-order to grow into the leader you were meant to be. Recognize that lonely roads are places of discovery. The happy/success roads rarely teach you and grow you. Lonely roads will help you know who is for you. True friends stay with you on lonely roads. Sycophants, posers and fair-weather friends won't go with you on lonely roads. You need to know who you can count on. This might be pre-navigation, but don't think that lonely roads are for others. Your greatest crucible will be the object of your greatness communication. Find and stay close to trusted advisors/mentors. Focus on your vision. Without a vision, lonely roads will convince you to give up. Remove the incongruent values from your life. Remember, expression deepens impression, so keep talking about your dreams. You are the dream and the dream is you. Find those you can help and do so. There is healing in helping others as they navigate a lonely road. Start writing (a blog, a journal, a diary). You don't want to leave your head full of your anger, your doubts, your fears. The blank page is your friend. Today I love the number 91! Waking Up In Corporate America hit #91 in the Motivation/Self-Improvement category on Amazon. Rankings can and do change, but I’m very happy just the same. I wanted to point you to a piece from BizJournals Columbus paper. It’s brief, but well done on me and my new book Waking Up In Corporate America. You have to be a print subscriber to view the entire article. I’ll post this article here when I get the entire version. Who could ask for more? The Motley Fool has a great article on the rating agencies’ (Moody’s, S&P, etc.) tell of woe. Now remember folks, no one is to blame and we’ve changed, just ask us. That would be a great PR campaign for Wall Street. Fear and greed still lives. 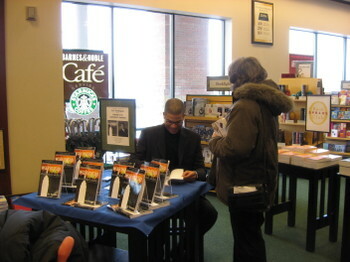 The below photos are from a book signing I did on February 2. 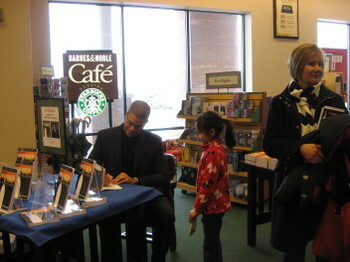 Barnes and Noble was the host and I had a great turn out. You can view the first installment of my virtual book tour with Scot Herrick of Cube Rules here. It will run thru Friday.